keralapost.gov.in is the official website of Postal Department Kerala Circle Postman / Mail Guard Recruitment Online 2017. Application Fees: Rs. 500 (General / OBC Male candidates) and Rs 100 (Women, SC / ST, Physically Challenged candidates) - Payment can be made from any post office with E-Payment Facility. 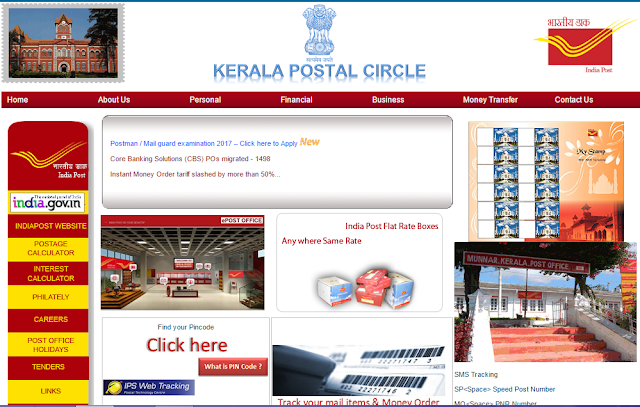 How to Apply Online for Kerala Post Man / Mail Guard Vacancies? Interested and Eligible candidates have to visit the official website http://keralapost.gov.in/ and click on Notification and Read the Notification First and then click on Apply under New Registration. Read the declaration and tick on the box provided and enter verification captcha and click on Save Details. After the submission of the application form a chalan will be generated. Make payment using the chalan in any Post Office with E-Payment facility after 3 days of applying online.